Andy Low of Random Access Podcast moderates a discussion between TC Petty III and Aaron & Austin from Dr. Wictz about our different design philosophies. In particular, we talk about the differences between Emergent vs. Analytical Board Game Design Strategies. The positives and negatives of each approach. And what situations/personalities best suit each style. This discussion is motivated from TC Petty III's retort to Dr. Wictz's statement in Dr. Wictz's post on "Writing Down the Rules." Dr. Wictz argued that writing down the rules before play testing was so important that he couldn't understand "when people say it's an early design, and so fluid that I have nothing written down." TC Petty III stood up for non-analytical designers and after explaining part of his designed process, called Dr. Wictz out, saying, "The reason I don't write rules is not laziness, but because my brain doesn't process creative information like an analytical system designer until I'm developing a working system." The podcast can also be downloaded from archive.org. A month ago I talked about how the controlling idea helps me better prepare a game for playtesting. Today, I am going to talk about how the controlling idea helps me use feedback from the playtesting of Underground Street Racing at the UNPUB Mini in Chantilly, Virginia. For those of you not familiar with my game Underground Street Racing, the original controlling idea was for the players to experience the dynamic, fast, and has twisted turns of fate of snowboard cross, a Winter Olympic event. I discovered during my iterative design phase that being true to a snowboard cross theme made the game too complicated, and that I could preserve the same experience by resetting the controlling idea and the theme to Underground Street Racing. What playtesting revealed to me is while I had internally altered the controlling idea to be about underground street racing, some of the language I was using in the game was thematically snowboard cross. In the version of Underground Street Racing that I was playtesting, cars could go too fast and crash. When a car crashed it also crashed into other cars around it and forces all the crashed cars to stop before accelerating back into the race. This frustrated my playtesters. The pointed out that when there is a crash in an unregulated street race, especially if it takes out more than one car, there is no expectation of anyone walking away, let alone continuing the race. That is when I realized crashes for going too fast was a byproduct of my old controlling idea and theme. When snowboarding, if you crash, you generally get right back up and keep going. Even if you crash into a few other people some bumps and bruises may be expected, but injuries are very rare. I needed players to stop imagining a horrendous NASCAR style crashes. So I thought back to my controlling idea of car racing and thought to myself what else can happen from going too fast in a car race that results in everyone slowing down, but not in the outright destruction of their car. That is when I started visualising cars spinning out in NASCAR races and all the nearby cars having to slow down to avoid crashing into it. So, I changed the terminology so that when a car goes too fast around a turn it loses control and spins-out. Cars that spin-out, stop, regain control, and then try to get back in the race. Cars around the car that spins-out also are forced to stop and then try to get back in the race to prevent a crash that would have eliminated them from the race altogether. Playtesting also showed me where my game was unsuccessfully meeting the goal of the controlling idea. I wanted strategic spin-outs throughout the race to be the twisted turns of fate within the race, but in repeated playtesting, each race had only one strategic spin-out close to the end. I quickly figured out this was due to having five lanes in the game, and it taking a player half the game to get into a position where it was possible for a car to spin-out. And so, five lanes became three to encourage more spin-outs. Even with the reduction in lanes, I still had a problem with the game not living up to the controlling idea. The race was not exciting enough. Originally when players came around a turn they could speed up or slow down by being above or below the target number with their dice. If players dice equaled the target number they remained at the same speed. Maintaining a good line through the turns was the only way to keep control and momentum to the next turn in the race. Each time a player played dice to move, they lost the dice from their hand unless the dice total equaled the target number, in which case they kept one die to use later in the race. I thought this setup would result in chaotic and exciting races with cars constantly speeding up and slowing down. Sadly, in actual game play this led to scripted races where players made sure to always hit the target number with all of their cars to keep as many dice as possible. Only at the end of the race did players use dice to move into the faster lanes for the win. I was at a lost at what to do until I received one suggestion that challenged my initial expectations on what was needed to achieve the controlling idea. The suggested change was to reverse the target mechanic, so that players only lose dice when they hit the target number. That meant speeding up or slowing down allowed players to keep dice in their hand. This had a massive effects on gameplay. Cars were now swerving all over the place on the board, and with the reduced amount of lanes it meant that a potential spin-out was on every turn. Players were not losing as many dice from their dice pool, letting me reduce by half the amount of dice each player needed to play the game. Initially in my design, without any playtesting, I would not have entertained this idea. I, incorrectly assumed that players needed the extra incentive to maintain a straight line through the course to better simulate strategic racing. After I instituted the change and saw how it drastically alter the game for the better, I realized players were already rewarded to maintain a steady course by avoiding a spin-out or stopping during the race. To create side to side motion created the risk needed to infuse the game with excitement throughout the race, I needed to make it harder to maintain a straight course. I discovered that this change to the game better adheres to the goals of my controlling idea and is now a fixture of the current version of the game. Having a controlling idea at the onset of playtesting helps to better channel suggestions to make the game stronger. I was able to take the feedback from the playtesters and discover flaws in my design that did not fit the theme or the desired experience of my current controlling idea and changed them to better fit the game. That said, the game still is a work in progress. I still need to get more playtests of the game to figure out where else I can improve it. If you wish to play test Underground Street Racing you can find the rules here, the print and play here, and the online feedback forms for the game here. I am grateful to any thoughts or pieces of advice you have. 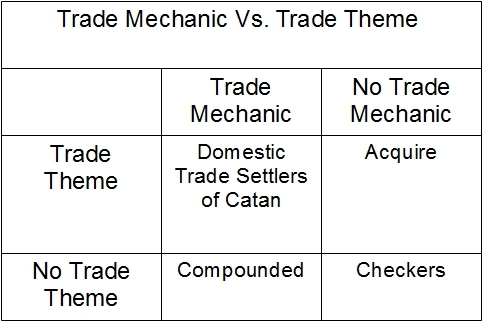 To understand why trade mechanics are important in board games you have to first understand why trade is important outside of board games. When I say trade I mean someone actually trading something with someone else. People can trade physical objects--I trade a banana for a coconut. People can trade actions--I will rub your shoulders if you rub my feet. People can trade actions for objects--I will babysit your kids and in exchange you will give me a shrubbery. The reason I trade a rubber ducky for a golf ball is because I value the golf ball more than the rubber ducky. If you gave me a golf ball for a rubber ducky then you value the rubber ducky more than the golf ball. Why can I say with confidence that I value the golf ball more than the rubber ducky and you value the rubber ducky more than the golf ball. Because we each voluntarily made an exchange with each other, and by exchanging we revealed our preferences. If I thought the golf ball was worth less than the rubber ducky then I would not have exchange the golf ball for the rubber ducky. Since we both value the goods we received in trade more than the good we exchange, we are both better off by making the trade. This is true even if someone complains about the price of the exchange prior to trading. If I spend the whole time arguing that the rubber duck is really worth two golf balls and not one, but I still exchange the rubber ducky for one golf ball, guess what, my reveal preference from the trade shows that I really value one golf ball more than a rubber ducky. People complain about prices for a variety of reasons. Much of the time they are just wishing they were able to get more bang for their buck. If I was willing to accept one golf ball for a rubber ducky there is no question I would happily also accept two golf balls for a rubber ducky. Notice we end up trading not only because we have things we value differently, but we each have something the other person wants. If I had a rubber ducky and you a ripped t-shirt covered in horse poo, there is nothing I am willing to give you for your ripped t-shirt covered in horse poo. I just do not want it and in a world of volunteer trading, I am not going to give you something to take it. Like real life, people make trades in board games because each person values what they are receiving in the trade more than what they are giving up in the trade. When I trade two wood for a stone with another player in Settlers of Catan that means I value the stone more than the wood and my trade partner values the wood more than the stone. If you are designing a game that utilizes a trade mechanic it needs to motivate players to value different goods differently. When everything is worth exactly the same there is no need for player trades. If a green cube is worth one victory point, and a red cube is worth one victory point, players have no incentive within the game to exchange cubes. Neither player gains any edge in gameplay by making an exchange. They are in fact the same good that happen to be different colors. Game designers desiring trade in their game need to also make sure trades exist where the players trading can benefit from the exchange. I am not going to make an exchange with another player unless I think it helps me win the game. The same goes with the person making the exchange with me. A player is not going to trade me three stones in Settlers of Catan if it will enable me to upgrade a settlement to a city and provide me with the last victory point I need to win the game. Creating an environment conducive to trading is challenging in board games since many board games, unlike the real world, are zero-sum games. A zero-sum game means that for one person to succeed everyone else must lose. When I win the game of Monopoly everyone else playing the game lost the game. In the real world, when I trade maple syrup I made with the butcher for a pound of beef, neither one of us is worried that the trade is going to give the other person an edge to defeat the other. I am excited because I now have some delicious beef to grill and the butcher is excited because he is going to use the maple syrup to glaze a ham. The butcher making a glaze ham has no negative effects on me. And me grilling some beef to eat has no negative effects on the butcher. But in board games, every trade I make has the risk of hurting me by giving my competitor a new resource he can use to beat me. That makes people guarded about the trades they make within a board game and makes it harder to construct a game where trading is a relevant mechanic to game play. A game with a trading theme is a game where gameplay is centered on a story where a player makes a trade with a real person or some defined other to get a good. In Acquire, people trade stock with a stock market. In Monopoly, players trade property with each other as part of the theme on making real estate deals. Settlers of Catan, players exchange goods with each other to represent trade between different colonists on an island. A trade mechanic is when players voluntarily exchange with other players. When I voluntarily exchange wood for stone with another player we are utilizing a trade mechanic in Settlers of Catan. Not all games with a trade mechanic have a trade theme. Compounded is a game centered on making compounds in a chemistry lab. Players can exchange elements with each other to help them construct their compounds. The game is not marketed as a trading game. The story does not centered on who makes the best exchanges. But players can utilize a trade mechanic to help them win. Acquire is a trade themed game without a trade mechanic. Players are not making trades with each other. Stock buying in Acquired is just the theme for making strategic bets. The bank does not benefit when players buy stocks. It merely converts money from one value to the next based on a formula that calculates a number based on laying of tiles on the game board. Paying rent on property in Monopoly is not a trade mechanic either. Players are forced to pay rent by the rules of the game. Players do not negotiate with different property owners over which property to rent and enter into a voluntary agreement. They are told by dice rolls that you must rent this property and pay this fixed rent. Otherwise, you are not playing the game. In short, to prevent confusion over whether a game has a game mechanic or not you can always rely on answering a simple question. Do players voluntarily exchange with each other? For the game to contain a trade mechanic then players must engage in exchange voluntarily. I stumbled upon Oliver Kiley’s blog Big Game Theory after Gil Hova (@gilhova) shared Oliver’s post on the “Schools of Design and Their Core Priorities (http://www.big-game-theory.com/2014/06/Schools-of-Design.html). Right away I was impressed by the thought and depth Oliver put in his posts and I am happy he was able to stop by and talk with me about his blog. Dr. Wictz: Thank you Oliver for coming by the faculty lounge, before we get started could you provide a quick rundown about your blog Big Game Theory. Oliver Kiley: Big Game Theory! is a blog I started on BoardGameGeek (BGG) late in 2011, with the tagline "Musings on games, design, and the theory of everything." Big picture: I'm interested in discussing boardgames AND boardgame design in a more academic sense. Much of the blog's content is about building a framework for how we can better understand boardgames, the player's that player them, and experience that results. Dr. Wictz: What motivated you to start Big Game Theory? Oliver Kiley: I joined BGG in 2010 and kept coming across interesting articles or discussion threads that debated topics like the classification of games, lists of types of mechanics, different ways player interaction manifested, etc. Some of this was general discussion from a "player's" standpoint, and some of it was coming from a designer's perspective. As a player AND a designer, I thought it would be great to pull all these fascinating threads together and discuss the topics more directly through a blog. Nate Straight's BGG blog Straight Talk on Strategy Gaming (http://www.boardgamegeek.com/blog/64/straight-talk-on-strategy-gaming) was one my big inspirations that made me think, "I can do this too!" I love knowledge building efforts, and across all of these discussions I felt that so many of them degenerated into arguments about semantics and language. If my blog could play a role in better clarifying the language we use when talking about boardgames, then I felt I could make a contribution to advancing the quality of the discussions. Dr. Wictz: How did you come up with Big Game Theory as the name of your blog? Were there any other contenders? Oliver Kiley: I knew I wanted a fun, pithy name for the blog. The content was "serious stuff" but I didn't want to take the whole thing too seriously either, if you know what I mean. I wanted to keep the atmosphere open and friendly, despite the relative heaviness of the content. Sadly, there were no other name contenders (at least nothing I can recall). It was all just really bad, dry, or boring potential names, and I actually held off starting the blog because I couldn't come up with a name I liked! Eventually, I struck on the idea of Big Game Theory! as a name, since the blog was going to be about a lot of theorizing and conjecture and the play on the Big Bang Theory made sense in that regard. I'm a sucker for bad puns, but it makes for a recognizable name (I think). I also love science and science-fiction, particularly theoretical physics and space operas (respectively), so the name was perfect from that standpoint too. Dr, Wictz: You recently created a website separate from boardgamegeek and mentioned in a blog post that you hope the website will help you broaden your audience beyond board gamers to other types of gamers, like video. Why the urge to branch beyond board gamers? Oliver Kiley: Good question. I've played tabletop games of one sort or another throughout my entire life, from mass market stuff, to hobby games, to CCG's, to miniature games, etc. But up until the past 5 years had always played video games (specifically on the PC) significantly more. A few years ago I got burned out on PC gaming, and like many people wanted more face-to-face interaction with my friends in our gaming. So I (and my friends) dove far more purposefully into the boardgame hobby. Fast forward to the present. I'm currently at a moment in life where I'm pressed for time to organize and/or attend boardgame meet-ups. But I still need my fix! So I've turned my attention back towards video games, but those that are more of the turn-based strategy sort (and hence more analogous to boardgames). This also includes iOS titles and boardgame ports. Regardless, I've always enjoyed talking about video games, so bringing that perspective to the blog seemed like a reasonable fit. However, with this addition to the scope of the blog, having it only on BGG (predominantly a boardgame audience) seemed like it might alienate non-BGG members and limit the discussion as a result. Plus, I really wanted to play around with an alternative visual look and feel for the blog and have more personal control over the content. I'll continue to cross-post everything in both places. The discussions that occur on BGG can't be matched and I don't want to jeopardize that at all. Dr. Wictz: I notice that there are a ton more articles on boardgamegeek, is the long term plan to port all of them to your website? Oliver Kiley: Long-term, I'll move all of them over. It's a bit of a pain as the formatting needs to be reworked, but it's not too terrible. I'm enjoying the process somewhat though, because it's giving me an opportunity to look back on many of the older posts and reflect on what has been learned, what stuck on the wall, what was not as well-received, etc. I've been adding commentary to the header of some these older posts as I move them over to document those thoughts. The posts that generated a lot of discussion and interest I'll typically tweet about when I move it over and see if it restarts the conversation at all. Oliver KIley: One of the earlier posts, "Towards a Science of Boardgames (Part 1)" (http://www.big-game-theory.com/2012/01/towards-science-of-boardgames-part-i.html) would be the post to read. It lays the groundwork for game theorizing that much of the rest of the blog digs into in more depth. Dr. Wictz: I know you are passionate about the classification of board games. I too am passionate about board game classifications and game play--specifically economic mechanics and genres. I want to know how you distinguish between the economic genres and economic mechanics? Oliver Kiley: I should mention two things first. One: I studied environmental economics as a sub-focus during my graduate studies, so I have some interest and familiarity with economics (I mostly dealt with evaluation of non-market goods and services). Two: I unfortunately haven't actually played that many "economic" games - given that my main playgroups are not terribly interested in the genre. So where does that leave your question? I'm freewheeling here, but my sense is that there are lot of economic-like "mechanics" that are employed in a great number of games. Auctions, supply-demand tracks, stock holding, bidding, investment, etc. But these mechanics don't necessarily make the game an "economic game" as a whole. An economic game (as a genre) might employ those specific mechanics, or it might not. But principally an economic game would be about modeling (abstractly or realistically) some sort of market dynamic or set of incentive structures. The only game I feel like I can point to with any knowledge (even though I haven't played it) is Container - which as I understand it results in a player-driven market being created over the course of game. The discussion following Nate Straight's post on Train Games (http://www.boardgamegeek.com/blogpost/27515/empire-builder-and-the-modern-train-game) discussed this very notion in more depth - and constitutes the sum of my knowledge and thoughts on economic games. This is still a nebulous idea to me and needs more thought. Dr. Wictz: As you might guess, I would call the examples presented as the "supply and demand mechanic" as the (http://www.boardgamegeek.com/geeklist/55170/item/1333518#item1333518) as the "supply and demand theme mechanic" because exchange is set by the game and not negotiated between the players. Why might I be wrong, why might I be right? If BGG could adopt that instead of it's totally messy mechanics/categories field things would be a lot clearer for everyone! But I digress....back to the question. Selwyth's classification and definitions are meant to be taken as literally and directly as possible, if I can speak for Selwyth. The definition he uses for the "Supply and Demand" mechanic is "The cost of assets become more expensive/cheaper as players buy/sell more of it." Whether this is used in some other way for some other thematic purpose, or used in an "economic" game more specifically to model/simulate some type of economic behavior is another question. I'll also mention, that for MANY of the mechanics discussed in that taxonomy, there are probably multiple different variations or sub-classes within it. One could easily imagine Supply & Demand mechanics that used game-fixed values (e.g. the market in Glen More for example), versus other games where the mechanic has player's setting the prices (Container? Acquire?). Dr. Wictz: Are trading, stock, and auction mechanics better suited for Euro or Ameritrash games? Oliver Kiley: While some mechanics "tend" to be common with certain genres of games (e.g. consider at all the auction/bidding games among German Family games), I'm of the opinion that mechanics are mechanics, and whether they work or not within a certain genre depends entirely on the specific game being created. So I would assert that NO mechanics are inherently better or worse suited for ANY genre of games - it all just depends. How's that for a cop-out answer?! Dr. Wictz: Is there someone out there--other than me of course-- you wish to talk more about board game classifications? Oliver Kiley: I read Lewis Pulsipher's blog and have gotten into many heated (but still civil I hope) debates with him about game classification. While I disagree with a lot of his perspectives (particularly as they relate to the conflation between German and Euro games), I nevertheless come away learning something important from the conversation. And while I used to disagree with him often, I now find myself agreeing a lot more with what he has to say. Talking about classification with him in more depth would be illuminating. Dr. Wictz: You do not review too many games, but you review the ones you do in incredible depth. Why the deep reviews? Oliver Kiley: Why the deeper reviews? Jesse Dean and QwertyMartin on BGG have both made the call for more in-depth reviews, or perhaps more specifically "critical analysis" of games. QwertyMartin has launched two "Voice of Experience" contests, asking people to review/critique a game after that have played it many times and go beyond the usual, "hey, this game is fun, you should buy it!" type reviews. I've been a judge on that contest both times and it inspired me to write more of my own reviews (one has to be able to walk the walk, not just talk the talk, right?). I'm also slightly saddened that so much of the emphasis on reviews has shifted towards non-written media (podcasts and video reviews). Those can be great for people, but love reading a well constructed analysis of a game and those seem to be fewer and farther between as the years go by. So if I can write a few reviews to help stem the tide, I will. Dr. Wictz: How do you select which game to review? Oliver Kiley: If I'm going to write a longer review (really I'm writing "critical analysis" because I'm directing the writing towards a buy / not-buy decision), then it's typically for games where I feel like there is something important to say that hasn't already been said. With the Carcassonne: Hunters & Gatherers review I wanted to speak to the layering of depth that comes out of playing a game a lot with the same person. For Ginkgopolis, I think the game has been largely underappreciated and the review was a chance to talk about the high points of the game and provide some insight on it's theme. In summary, I'll write reviews about games I'm excited about and where I think there is something important to uncover or reveal about the game. I also strive to put the game in the context of the time when it was made and the time when I played it. Those are important parts of good review writing and critical analysis. Oliver Kiley: I like games with big open decision spaces, a lot of room for direct player interaction, where spatial positioning matters, and where the gameplay is player-driven (politicking welcome) and emergent. Some of my favorites in this regard are Tigris & Euphrates, Illuminati (yes the old Steve Jackson), Taluva (almost an abstract), Game of Thrones, Cyclades. And of course Hegemonic, the one published game I designed, which hits the mark quite well for me. Beyond that, I also like science fiction themed games, but really any theme is great so long as it meshes well with the mechanics. I've grown to avoid most modern complex euro's for the same reason, as they tend to focus too much on specific paths to victory (I want to run in the field, not the path! ), have constrained player interaction, emphasis on number crunching and optimization (instead of spatial positioning), and mechanics that are beholden only to themselves (and not the theme). Dr. Wictz: Before we wrap up, I must ask where should someone go to learn more about your blog? Thank you, and as always, cheers! Dr. Wictz: It was my pleasure. You can also follow Oliver on twitter @OliverKiley.